Militär, Staat und Gesellschaft im 20. Jahrhundert (1890-1990). The literature on the German military is massive and continues to flourish. Each year an influx of new works - memoirs, operational histories, biographies, and ongoing reappraisals of the Wehrmacht, appear on bookshelves, each aiming to fill a particular gap in the existing scholarship. In Germany, too, military history has moved strongly into the focus of historical interest in recent years. For scholars making their initial foray into the field, navigating the vast expanse of literature can be daunting. 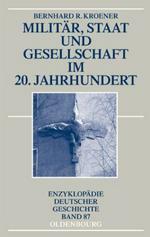 Fortunately, the editors of the “Enzyklopädie Deutscher Geschichte” have devoted three volumes to German military history, of which this is the second. These books aim to provide scholars with an accessible, succinct historiography that incorporates an overview of the present scholarship as well as current research trends in the field. The first volume, by Ralf Pröve, explores Germany’s “long” nineteenth century. In the second installment under review here, Bernhard Kroener focuses on the period 1890-1990, perhaps the most contentious periods in modern Germany. Kroener currently serves as Chair of Military History and Cultural History of Violence at the Universität Potsdam, and has worked as a researcher at the Germany’s Military History Research Institute since 1978. He is perhaps best known for his contributions to the official ten-volume history of World War II, Germany and the Second World War. Most recently, he published an important biography of General Friedrich Fromm, the commander of the Reserve Army (Ersatzheer) and a pivotal figure during the plot on 20 July 1944. The book is divided into three sections: the first is a chronological overview of the major developments in Germany between 1890 and 1990; part II is an analysis of key trends in the current scholarship; the final section is a comprehensive bibliography. Kroener begins by answering the obvious question: why 1890 as a starting point? He disputes George Kennan’s depiction of World War I as the “seminal catastrophe of the Twentieth Century,” as it overlooks the fact that the major European powers were approaching the cataclysm already twenty years before. To understand 1914 and all that followed, Kroner argues, one must look back to 1890. In not only Germany but Europe in general, this decade marked a period where foreign policy was increasingly driven by radical nationalist ambitions. In tandem with the dismantling of diplomatic safeguards that prevented military confrontation between the major powers, there was growing acceptance throughout Europe that conflict was unavoidable, even necessary, and a viable recourse over diplomacy (p. 1-2). The careers of the 1890s generation of German officers closely followed the trajectory of German history in the twentieth century. These men experienced the First World War in the trenches as junior officers, then witnessed the collapse of the Kaiserreich. Retained in the 100,000-man Reichswehr of the Weimar period, they envisioned the war of the future, and formulated a concept of total warfare that would culminate in genocide under Hitler. Despite having held positions of key influence during the Third Reich, many would go on to play a decisive role in the formation of the West German Bundeswehr and Nationale Volksarmee (NVA) of the GDR. Part I begins with a chronological overview of the major developments through 1990. As the book’s title suggests, a dominant strand is the changing relationship between military, state, and society in Germany. In the Kaiserreich, the army was an important institution in the nation-building process, as it strove to instill an awareness of national belonging amongst the young men drafted into its ranks. Kroener correctly states that the army was an integrating force, that by opening its officer ranks to the middle classes it made them stakeholders in the new German nation (p. 5). Yet, it simultaneously functioned as a mechanism of exclusion, and polarized significant segments of society. Shunned from becoming members of the officers’ corps were socialists, Jews, and the working classes. During the Weimar era, the army became a professional elite that maintained a tenuous coexistence vis-à-vis the state. It tactically distanced itself from the social democratic government by declaring itself “unpolitical,” and though general conscription was abolished, the military exerted its influence through the numerous paramilitary and veterans’ organizations that were openly hostile to the Republic (p. 18-19). The army’s role during the Third Reich is well known: it willingly relinquished its role as the “school of the nation” to Hitler and, in theory, left political indoctrination to the plethora of Nazi youth organizations (p. 22-23). But as the war progressed the military, too, would increasingly inculcate its soldiers in the ideology of National Socialism. Only after 1955, in the fourth attempt to create a new army, did German leaders apparently succeed, so Kroener, in creating a military that was anchored in the legal structures of a democratic state and universally accepted, if not particularly liked, by mainstream society. Under the concept of “Innere Führung,” German soldiers for the first time were envisioned as citizens in uniform, not subject to the discipline of an extra-legal institution (p. 41-44). This project finally reached fruition in 1990 with German reunification and the dissolution of the East German NVA. In Part II, Kroener moves on to analyze specific issues and controversies in the existing scholarship. After describing major historiographical shifts in the field of military history in Germany over the past century, he investigates a range of issues, including the extra-constitutional position of the army during the Kaiserreich. His critique of the present scholarship is both insightful and thought provoking. Dismissing the notion of a military Sonderweg, he stresses that the army did not operate in complete isolation from mainstream society. Military culture and practices did not evolve in a vacuum, rather they were determined by a reciprocal exchange of values, attitudes, and expectations with civilian society. Kroener points out that most studies focus on the militarization of society through the army, yet need to address how the military reflected the social relationships of Imperial Germany (p. 64-66). When assessing the Wehrmacht’s role in the Final Solution, Kroener confirms what is already known: that the military uncritically accepted Hitler’s rules of warfare during the Soviet campaign and was complicit in perpetrating the Holocaust. But he does not sufficiently challenge the dichotomy separating the jurisdiction of the army and SS during the eastern campaign, which tasked the former with war-fighting (Waffenkrieg), while Himmler’s Einsatzgruppen pacified the conquered territories (p. 31-32). At best, this was a theoretical construction. Missing here is a wider discussion that incorporates the Wehrmacht’s anti-partisan operations, which converged the military and genocidal aspects of Nazi Germany’s war of annihilation. Mentioned only briefly is the General Staff’s military planning for Operation Barbarossa, which calculated millions of civilian deaths through starvation and forced labor (p. 81). Overall, readers would benefit from a more focused discussion on genocidal warfare, specifically the interrelation between combat and genocide in the east, which had become a major component in the German “way of war” during the Nazi era. These small criticisms aside, this book is an important contribution to a field about which much has been written. The author has succeeded, in just under 140 pages, in producing a comprehensive historiographical survey of German military history. This work is a particularly indispensable research tool for graduate students, as it throws light on the major scholarship and controversies in the field. If regularly updated by the author, is likely to remain a crucial reference, and should be required reading for anyone who wishes to understand the German military’s place in the twentieth century. Ralf Pröve, Militär, Staat und Gesellschaft im 19. Jahrhundert, München 2006. Michael Geheran: Rezension zu: Kroener, Bernhard R.: Militär, Staat und Gesellschaft im 20. Jahrhundert (1890-1990). München 2010 , in: H-Soz-Kult, 10.11.2011, <www.hsozkult.de/publicationreview/id/rezbuecher-16808>.